Hyperhidrosis is a condition where you sweat excessively. Many people who suffer from nervous sweating mistakenly think that they are suffering from the former. However, this is inaccurate. So, how do you know that you are suffering from nervous sweating? It is quite simple. If anxiety and other nervous situations leave you in a pool of your own sweat, then you are suffering from nervous sweating. The nerves or anxiety could be triggered by something as simple as a first date, a work presentation or even the mere thought that you have to sit and eat alone while others are seated with other people. Whenever your body senses danger, the natural response is fight or flight. The latter can be manifested in different ways, including excessive sweat. Whenever you are nervous or anxious about something, you end up forgetting the stressor and focus more on the reaction caused by it. This might cause an increase in blood pressure, a sudden increase in the heart rate and could even manifest in high body temperature. This then triggers the sweating which is accompanied by a bad smell, differing from the sweaty smell you get after exercising. 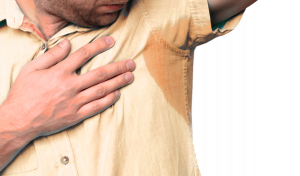 While nervous sweating differs from hyperhidrosis in definition, the side effects of the former are similar to those of the latter. Whether or not you are sweating because you are afraid of a work presentation, pitch or because you are talking to an attractive person or as a result of overactive sweat glands, the fact remains that you are still in a poll of sweat. This can be the fastest way to ruin a career since it destroys your confidence and makes you self conscious. It is therefore difficult to convince people that you are the person for the job. Additionally, it might come in the way of landing a client during a pitch. The client is able to see your nervousness through your sweating and is therefore not confident in the solution that you have to offer. Additionally, as research by the Monell Chemical Senses Center in Philadelphia has shown, people are likely to judge you as incompetent, untrustworthy and see a lack of confidence in you as a result of the smell that comes with nervous sweating. Like nervous sweating, stress sweating is your body’s response to stimuli which springs from focusing on the reaction as opposed to rationally dealing with the stimuli. In the case of stress sweating, your sweat glands gush sweat due to stressful situations. These include: working to beat a deadline, trying to juggle family life and your career or even responsibilities such as paying some bills. Once you understand the root cause of the stress you are experiencing, it is easy to curb stress sweating. You can learn some ways to deal with stress and thus reduce sweating. You do not need to deal with a raised heart rate, high body temperature and other physical responses that trigger the sweat. You can get rid of it and the pungent odour that accompanies stress sweating. How Does Stress Sweating Affect You? Stressful situations such as family gatherings or work presentations that cause you to sweat excessively will have the same effects as those of hyperhidrosis. Sweating naturally shows that you are nervous and not confident. Confidence, on the other hand, is the backbone of a successful career as shown by a study in the University of Melbourne. Those who have high confidence are more likely to earn a higher income and climb the ladder through promotions faster than those who do not show confidence. Sweating influences your perception about yourself as well as others’ perception of you. it reduces your self-confidence and also shows others that you are possibly incompetent and untrustworthy according to Monell Chemical Senses Center in Philadelphia through research they conducted. You do not want to let stress sweating cripple your work life. There are different ways to overcome stress sweating. You cannot avoid the stimuli that cause stress. You need to recognize that you will experience pressure and stress from time to time. You need to know how to deal with it in order to take charge of your life.